Jack Dorsey has returned to Twitter. With him comes the hope of showing more people the value of the platform. Maybe they’ll never tweet. Maybe they’ll never follow anyone. But they’ll hopefully get caught up in a Moment or two. Or millions of them. Stop me if you’ve heard this one: Twitter has to kickstart its growth. But how? It’s easy to pick on a problem, but it’s not so easy to come up with a solution. 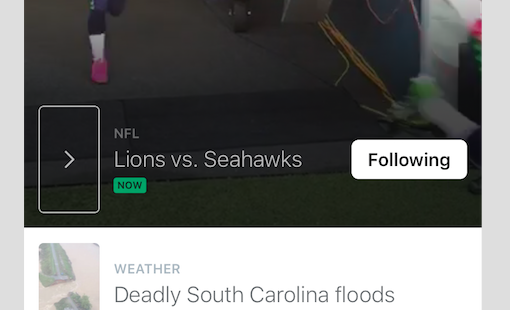 Today, Twitter launches a feature called Moments, which it believes is step one to a solution. It’s available as a new tab on the iOS and Android apps and on desktop web in the U.S. The way that most hard-core Twitter users experience the service is through their timeline, which shows what’s been tweeted in order. If someone shares a tweet, then it shows up in your timeline too via a retweet. But that means habitually checking Twitter, keeping the app open or opening it multiple times a day to make sure you don’t miss anything. Catching lightning in a bottle — a news story unfolding for example — is really difficult. But long time users have trained themselves to do it. Normals have no interest in spending that much time on or in any app. Period. Hence the need for growth and why Moments is so important. As I’ve outlined, most people consume tweets through means other than the actual Twitter platform. You can catch what Trump tweeted on CNN or you can hear about the Yankees clinching a postseason spot on ESPN. It’s easy to get value out of Twitter when a curating funnel (people, an algorithm, etc) is getting rid of the noise and showing you why something is interesting and giving it full context. That’s what Moments sets out to do — create context from chaos. The internal codename for this project has been “Lightning,” which refers to pulling together the best of Twitter in a quick and efficient way. I like to refer to it as “Glacier,” because it slows everything down and gives you the ability to look around without feeling the stress of a thousand other things happening at once. The few that were in the bucket for a “News” tab that Twitter tested a few months back won’t be jarred by the positioning of Moments in the product. Ever see a Twitter trending list? It’s really overwhelming. What does it all mean? What is that hashtag for? With Moments for iOS and Android, all of the dirty Twitter laundry goes away. You’re presented with a prettier presentation in a way that is fun to scroll through. Not up and down, but side to side. It requires less interaction, none at all really, which is what trips people up in the first place. You don’t have to follow individual accounts, but you can follow a Moment if you like. Following a Moment notifies you when an event starts and then injects content into your timeline that fall under said Moment. Basically, follow the NHL game, not the NHL teams. Get the same content. Share a Moment, not a single tweet that probably lacks context. There is less confusion all around. This is the feature Twitter would have shipped years ago if it knew what it knows now. Luckily, user data, feedback and anecdotes have led them to pulling the trigger now. My favorite touch is the note letting you know that you’re now up to date on the topic discussed in the Moment. If the Moment gets updated, you can go back to see what’s been added. It’s very similar to a feature within Yahoo News Digest (disclosure: I worked at Yahoo for a bit), which was my favorite part of that app…you got feedback letting you know you were done. You felt like you accomplished something. Moments can contain tweets, videos, Vines and GIFs. Full-bleed and purty. It’s the beginnings of a super tweet. I did notice that Periscope streams were missing, but you have to believe that they’re on the way. Also, if we’re ever going to see “full text” functionality, this would be the place that it pops up too. Think Facebook Instant articles. To start, the company will be putting together Moments with launch partners Bleacher Report, BuzzFeed, Entertainment Weekly, Fox News, Getty Images, Mashable, MLB, NASA, New York Times, Vogue and the Washington Post. Pretty mainstream outlets that release quality content. Worth pointing out is the fact that these things look pretty monetizable, so newly seated COO Adam Bain should have a field day selling promoted ones eventually. Not so fast. While Moments is a slick feature, it’s not a silver bullet…nothing is. Twitter is going to have to do some heavy lifting to bring people back to try the product they may have abandoned so many moons ago. Muthukumar says this is a front door; it’s not a new house. In other words, it’s a good start. However, if Twitter can’t get news items up fast enough or their partners fail them with misinformation, leaning one way or another too much politically or not being interesting enough, it could blow up in their face. Since the new front door is what’s going to start welcoming folks back, it could also slam the door shut on ever trying it again with a bad first impression. Speaking of not-so-great first impressions, Moments on the desktop web is a mess. The team has tried to display content in a way that’s visually compelling but it just can’t compete with the smooth right to left scrolling that mobile gives you. While I realize that most users are going to be coming from their phones, it’s still essential to have all of your “doors” painted the same way. If I’m coming back to Twitter for the first time in years and I see this mess above? I’m outta there and I’m not coming back. Basically it’s three tweets blocked in together in a way that doesn’t feel like it makes sense, and it requires me to take an action, a click, to see more. On mobile, I get to see it all. Jack Dorsey is back as CEO of his creation. He’s been involved in Project Lightning since its inception we’re told, so his legacy as a leader is on the line as much as Twitter being known as a growing company is. Everyone needs a win here. At the end of the day, it’s time to get people consuming tweets on the actual platform; forget about engagement for now. 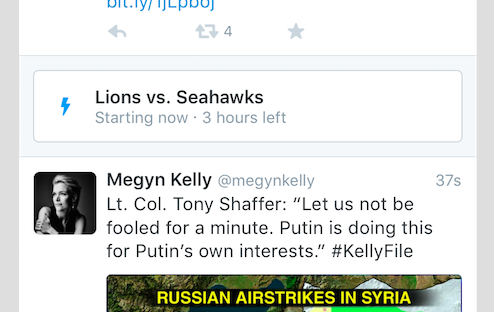 I think that this version of Twitter is ready for a TV commercial, much like the ones that Facebook are running now. They really humanize the service and Twitter needs to do quite a bit of that. I feel like with Moments, I don’t have to explain the ins and outs of the service as much, and the same goes for Twitter’s employees. People will see a “finished product” which is a Moment, and then immediately understand that there were a bunch of people behind creating it. People on the scene of an accident, reporters, news agencies, photographers and more. Yes, this is a similar concept to Snapchat Stories, and there are elements of Yahoo News Digest and Circa here…but that’s okay, it means that Twitter has been paying attention to content consumption for the past few years, especially on mobile devices. Because that’s where the next 316 million worldwide users (of the actual product) are going to come from.